This audio description has been compiled by Joe Turnbull in February 2017. It was commissioned by Disability Arts Online on behalf of NDACA (the National Disability Arts Collection and Archive). It is approximately 7 and a half minutes long. 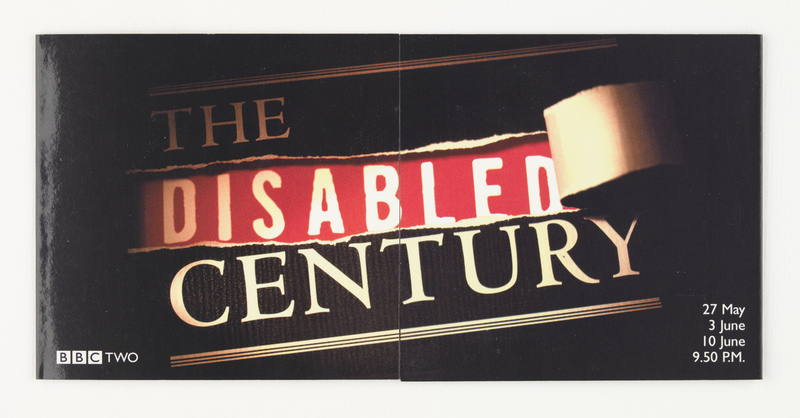 ‘The Disabled Century’ is a promotional ‘transmission card’, of roughly postcard size. A large mocked-up sign dominates the image, which reads ‘The Disabled Century’ in block capitals, each word on its own line. The word ‘THE’ and ‘CENTURY’ appear in a white serif font, similar to Times New Roman. The space between these two words appears to have been ripped, and peeled off to the right-hand side, revealing the word ‘DISABLED’ in a white serif font set against a stark red background underneath the torn paper. It has the effect of making the word disabled stand out prominently. In the bottom right of the transmission card are the original air dates and times: 27 May, 3 June, 10 June, 9.50pm – each piece of information printed on a new line, in simple white font. On the left-hand side is the classic BBC Two logo; with the letters BBC in black against small white boxes, the word Two in simple white text. The transmission card is printed with a glossy black finish. The transmission card was produced by the BBC’s Disability Programme Unit to promote the series The Disabled Century in 1999 and would have been given out to press and other interested parties ahead of its broadcast. Transmission details and publicity blurb are on the reverse of the card, though this is not visible. The Disabled Century was a series of three films directed, produced and written by David Hevey, which explored numerous events of the Twentieth Century from the perspective of British disabled people. It originally aired in May and June 1999 and has been re-broadcast by the BBC numerous times, the most recent being in May 2012 on BBC Four. Each episode explored a different period of the Twentieth Century, delving in to the changing issues disabled people faced. Prominent British actor, Paul Scofield narrated all three episodes. Episode one looked at the experiences of those who became disabled while fighting for their country in the two world wars. It explored the harsh, often brutal realities that confronted the vast majority of disabled people in the early years of the century. It covers World War I heroes reduced to begging in the streets; Horace Blackburn’s struggle to get work; Bill Surrey, in institutions for 77 years; Gladys Brooks, strapped to a steel frame for two and a half years; Snowy Harding, whose family could not afford a wheelchair; fighter ace Douglas Bader, who lost both legs; and the Guinea Pig Club. Episode two explored whether the creation of the welfare state made life better for Britain’s disabled community, and the rights that disabled groups, including blind people and those affected by thalidomide, began to demand. The episode features an interview with a young Mat Fraser, who would go on to be a prominent disabled actor, recounting the experience of having compensation awarded for his thalidomide-induced Phocomelia. The third and final episode looks at the problems disabled people faced as they moved out of institutions and into the community. The 1980s and 90s proved to be a turning point as more people were prepared to fight for wider recognition and rights. The episode charts the rise of the disability civil rights movement with a particular focus on the activism of the ‘Direct Action Network’ (DAN) and the protests they undertook in the 1990s. It also explores the concept of ‘disability pride’. The series received praise from mainstream newspaper critics and social commentators alike. Writing in The Times Paul Hoggart described it as “Visually striking”. The Independent’s Robert Hanks remarked: “Beauty and eloquence perpetually forced the viewer to look and hear in fresh ways”. Polly Toynbee of the Guardian said it was “social history at its finest”. David Hevey is a cultural producer, filmmaker, photographer and current CEO of Shape Arts. Before taking up this post he was Project Director at NDACA. Hevey’s film credits include three films for the landmark BBC documentary series Modern Times, and he has appeared as a presenter and critic, respectively, on From The Edge and The Late Review, both on BBC 2. Hevey also wrote the book The Creatures Time Forgot: Photography and Disability Imagery, described as ‘a political autobiography’ which was published by Routledge in 1992. His photography was also featured in Photography: A Cultural History published by Laurence King Publishing in 2006. Hevey is considered a pioneer in shifting visual representations of disabled people through both his film and photography work, and a strong advocate for disabled people’s rights.